« A fun pumpkin to carve, this was. It’s fun to have extra reasons to be creative. 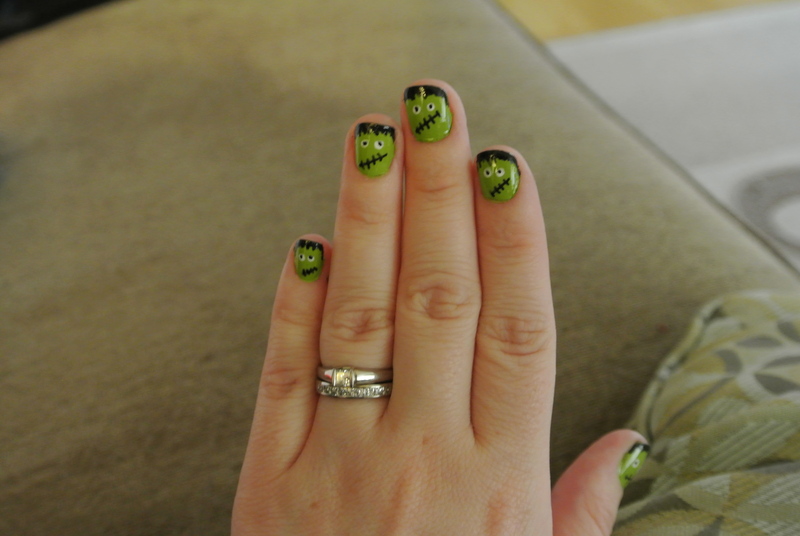 I saw a really cute pin on Pinterest where someone had painted their fingernails to look like little Frankenstein’s Monsters and thought I’d try my hand at it. I’m pretty happy with them. Happy enough to try this nail art thing again sometime. I love fall. The colours, the way the air smells, Halloween! I get this sort of giddy feeling when the temperature lowers and it’s almost as though I can finally breathe. Don’t get me wrong, summertime is fun but sometimes the heat seems almost oppressive. I’ll miss the warm breeze on my shoulders but there’s something comforting about fall clothes- soft sweaters, comfy slippers, leggings- that I just love. I’m also a COAT person. I love me some coats. I’ve had my eye on this gorgeous black cape style coat for a little while and my husband bought it for me on the weekend. LOVE! It’s gorgeous. I didn’t even want a bag for it- I asked the cashier if I could just wear it out of the store. Halloween is so much fun too. The idea of dressing up and being something that you’re not- even for just one night- just has that appeal to it. Thinking back to some of the costumes I’ve worn over the years- One year my mom braided my hair around a wire coat hanger and I went as Pippi Longstocking. When I was in the 7th grade I went as a “responsible adult”.. sensible heels, skirt, blazer and a suitcase (don’t ask me how I came up with that one!). Now that I have a daughter it’s turned to a whole different kind of fun. Last year she was a monkey. Not just ANY monkey.. an organ grinder’s monkey with a little fez hat and vest. At the last minute I crocheted a banana to go with her outfit and nearly DIED laughing when she shoved it in her mouth (yes, I know it’s not unusual for a toddler to put something in their mouth but she grabbed it and started munching on the “right” end). Well, today has proven to be another case of not working on things I should be working on. Book club has been postponed so at least I don’t have to finish my book today. I’ll put the pedal to the metal and get some more hats done for the show this weekend!